George Dowell dreamed of playing professional football before a car crash left him paralysed from the chest down and changed his life forever. However, Dowell who used to play for Worthing FC now has a different dream - guiding the club to Conference South. The former defender, 22, has bought the club he used to play for after using compensation from his accident to help the financially-troubled side. "Nothing beats playing, ask any retired player," Dowell told BBC South Today. "You have to find the next best thing and the next best thing is being a coach or an owner." Dowell's impact is already being felt at the Isthmian League Division One South club with a new 3G pitch being laid as well as plans to redevelop the stadium. He first joined the club in 2008 as a 16-year-old and played for the youth team before earning a couple of appearances on the bench before his accident in April 2010. "A couple of days after my final appearance on the bench for the first team I was involved in a road traffic accident and broke my spine and was paralysed from the chest down and that was the end of that," he said. "I don't remember too much of the car crash, I've been told the car flipped and I ended up in a field." Dowell was taken to the Intensive Trauma Unit at Chichester hospital before being transferred to Salisbury spinal unit. "I was there for 10 months and for total rehab," he added. 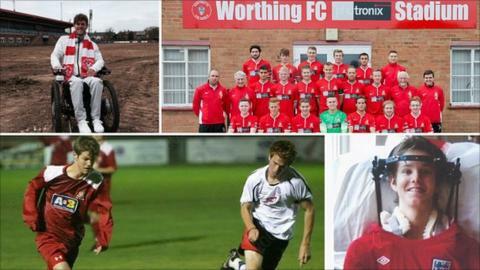 He started a new club called Worthing Borough before seeing a story about money troubles at Worthing FC. "It took me a while to get back involved in football," he said. "I saw in the paper Worthing FC were in financial trouble. I still knew a couple of people at the club, came to see the people in charge so I thought I could help, I took a punt and here we are." He says he is likely to spend "hundreds of thousands" of pounds on the club but hopes it can also benefit the whole community. "We're putting down the 3G pitch," he added. "When Worthing aren't using it the rest of the community can come and use it. It's great having a football centre that everyone can use. "I love football but it's also a business decision. It will hopefully filter from younger players to the Worthing team and attract new players. The five-year plan is we want to be in Conference South."